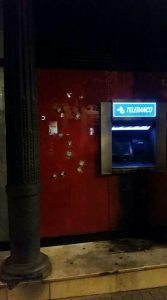 On June 7, 2017, around 250 people gathered in front of the Lesseps library in the Gracia neighbourhood to express their rage at the 7-and-a-half-year prison sentence given to the anarchist comrade for the robbery Pax-bank branch in November 2014 in the German city of Aachen. The demonstration began at 20:45 with the reading of a statement expressing the rejection of the structures of the State and the Church, once again main actors in this judicial spectacle. From the outset, the character of the demonstration was clearly determined, we were on the streets to show our enemies our increased rage because of the kidnapping of our comrade by the German State. The streets of Gracia were filled with hatred at the cry of LIBERTY FOR IMPRISONED ANARCHISTS. 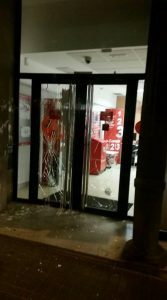 A first target, the college of economists of Catalonia, was attacked at the intersection with the Príncep of Asturias street. From then on, the demonstration continued in a combative fashion in the main streets of the neighborhood, breaking down the windows and setting fire to the ATMs of various banking agencies, real estate offices, and other symbols of capitalism. Everything that is part of the capitalist machine was targeted. The demonstration ended on the Plaza del Sol with the reading of the statement, without police charges or arrests. No sentence, no judge, no police force, no state can restrain our desires for freedom. We will stand by the side of our comrades, although our enemies claim to isolate them. It is clear to us that solidarity must not only be the result of punctual moments like this, but that it is at the root of our struggles. May our solidarity, hatred and passion break down the walls that enclose all our brothers and sisters, anywhere in the world. This entry was posted in English, solidarity by solidariteit. Bookmark the permalink.